It is with bittersweet sentiments that we present the collaboration between Illesteva and the recently departed icon Lou Reed. We received these shades just prior to Reed’s untimely passing and were a bit conflicted how to proceed. As longtime fans of Reed, and given the fact that he was so involved in every detail that went into the design of these sunglasses, we felt it would be a disservice not to release them to the public as he intended. Originator, poet, and rock star are just a few of the phrases used to describe native New Yorker Lou Reed — Founder and pioneering front man of the rock band The Velvet Underground and undoubtedly one of the most influential musicians of all-time. Throughout his career, Reed was an avid sunglass wearer always sporting a pair of signature shades, so it was with joy that he helped to create his own. 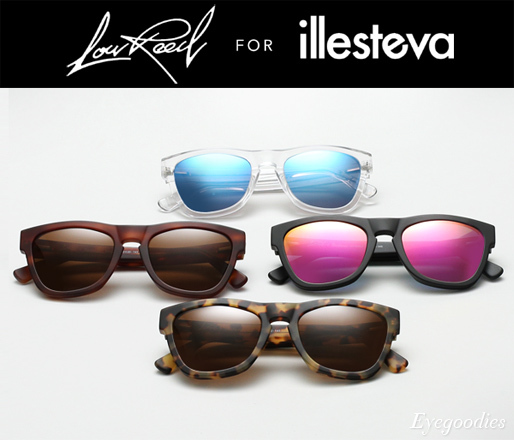 The “Lou Reed for Illesteva” capsule collection features two timeless styles, an acetate frame and a metal aviator. Handmade in Italy, each design is available in an assortment of colors ranging from the classic to those with colored mirrored lenses. An icon reborn. 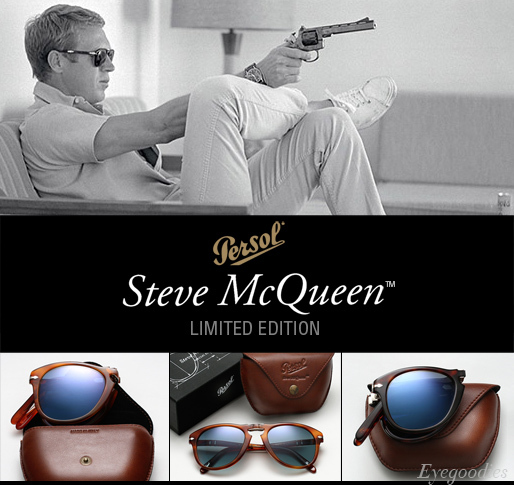 Persol’s limited edition Steve McQueen 714. Over fifty years after its original release Persol’s 714 model remains one of the most classic sunglasses of all time. Since its inception the pioneering foldable frame was the epitome of timeless design and style — However, it was undeniably elevated to legendary status by the iconic “King of Cool”, the late Steve McQueen. 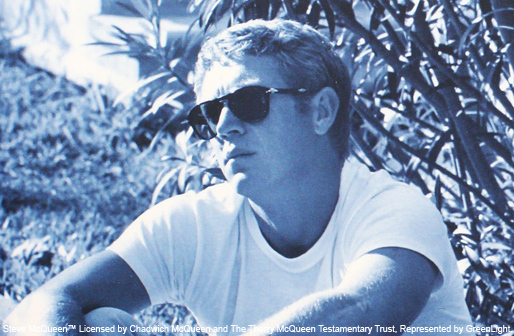 Worn by McQueen both off screen and on, in movies such as “The Getaway” and most notably “The Thomas Crown Affair” where he unforgettably sported a pair of 714’s with lenses he had custom tinted blue (be sure to ask us about our custom lens work). In fact a similar pair from McQueen’s own personal collection was auctioned off in 2006 for a staggering $70,200. To pay tribute to the 714’s history and the man who cemented its legacy, Persol has released a very limited Steve McQueen edition of the timeless frame, the “714SM”. There are a couple key and cool distinctions between the 714 and the limited 714SM, including: inward folding hinges which showcase the signature Persol double arrow, as it was originally in the 1960’s and on the pair McQueen wore. They are offered in a host of exclusive lens options including technologically advanced blue lenses. And last but certainly not least, the frame is topped off with limited edition packaging and a premium Italian leather pouch which easily slips into a coat pocket. 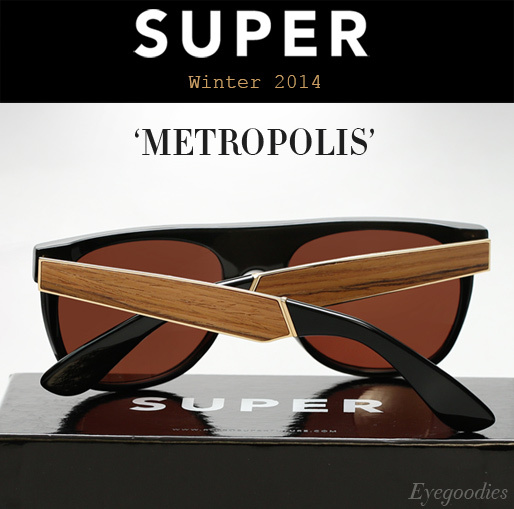 The new Super sunglasses Winter 2014 Collection is now available. Super’s new winter collection takes its cues from Fritz Lang’s 1927 iconic science fiction film ‘Metropolis’ and retro super futuristic interpretations of 20’s style. We presented the first installment of the collection last month, the winter range yields an assortment of new one of a kind designs for the cold winter months ahead. Striking the balance between the rough and crude, whilst remaining polished and refined, the lineup features an innovative mixture of textures and opulent materials. Acetate is creatively combined with materials such as: leather, steel, and even wood which is set on top gold metal in one of our favorite series named “Francis G Wood”. 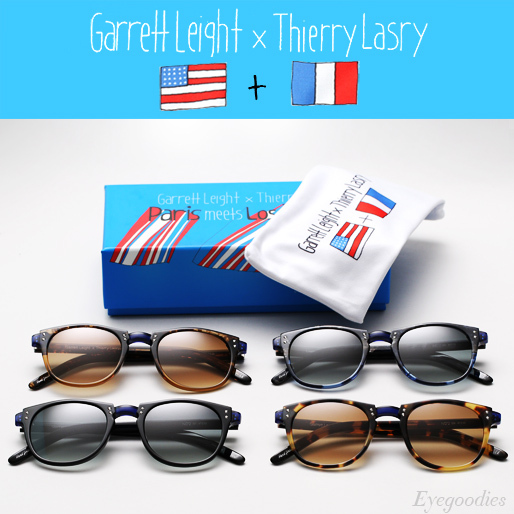 Garrett Leight X Thierry Lasry … Paris Meets Los Angeles, No. 2 – Limited Edition is now available. Los Angeles based Garrett Leight California Optical and renowned Parisian eyewear brand Thierry Lasry, are back for their second limited edition collaborative release for winter 2013/2014. Rarely do you see two direct eyewear brands get together, but when they do it is usually something special, especially when these two are involved (both long time brands here at Eyegoodies). Revisiting the success of their previous collaboration, the latest incarnation draws inspiration from each designer’s home city — with each seamlessly incorporating their own signature style. The sunglass, simply named “Number 2″ (for their second collaboration), takes a classic shape and imparts a deconstructed twist. Available in four main colors, each of which features blue acetate components at the bridge and temples which showcase the exposed hand-drilled rivets and screws. 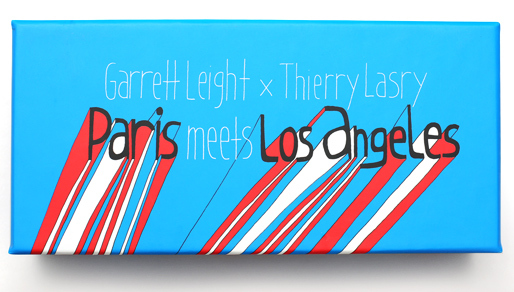 To commemorate the collaboration Garrett Leight and Thierry Lasry invited Los Angeles based artist Ashkahn to design a special edition box and carrying pouch as his own interpretation of each of the respective cities.